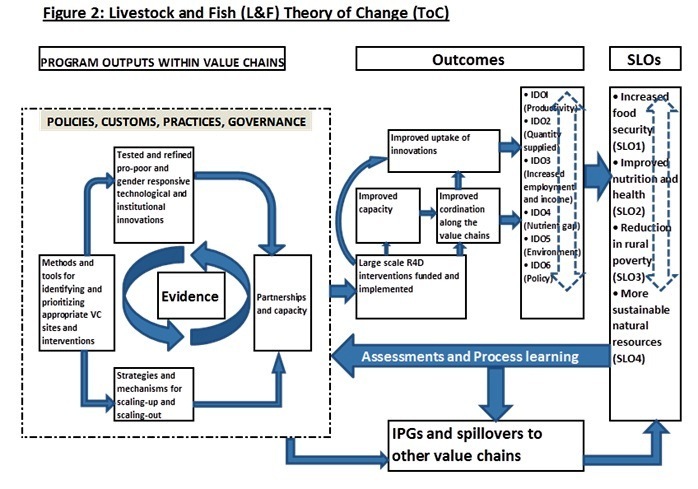 All CGIAR research programs have a theory of change (ToC) and associated ‘intermediate development outcomes’ (IDO) that contribute to the overall strategy and results framework (SRF) and system level outcomes (SLO) of the CGIAR Consortium. Increased employment and income for low-income actors in the target value chains, with an increased share of employment for and income controlled by low-income women (SLO1) The CRP also seeks to reduce poverty through the income generation opportunities created within the target value chains. Targets to be set based on planned participation levels. Lower environment impacts and higher benefits per unit of commodity produced in the target value chains (SLO4) Improving productivity and value chain efficiency will contribute to reduce the pressure on natural resources (e.g., use of fodder, improved grazing management, vaccines replacing acaricides, more efficient use of crop residues, management of excreta), but also will help reduce the emission of GHG per unit of product.